TTT 323 is used to regulate personnel and visitor access to opulent spaces like holding headquarters, financial institutions, banks, and all sites where aesthetics is a priority. TANSA turnstiles are ideal for both unidirectional and birectional passages which can be free or access- controlled. Even though access in both directions can be controlled by a card-reader, the authorized security personnel of the client can override that setting for card-free access during certain times of the day. TANSA turnstiles allow free exit out of the site or the building in case of a power failure, a feature mandated by law. If the customer wants the turnstiles remain locked during such an emergency, such functionality can be provided as an option, contingent upon the written request of the client. However, once set at the factory, the system then cannot be switched back to the emergency-exit state by the client and it remains locked during all subsequent power failures. The rotational direction of the turnstile arms during entries and exits alike is regulated by internal sensors. For emergency situations like fire or earthquake that necessitate rapid evacuation, TANSA turnstiles come with optional drop-off turnstile arm option which is actuated by a signal received from the earthquake detection system. That ensures quick and safe exit from the building or the site. In a similar manner, the arm can drop off to the side with one push of a button during protocol events to allow unimpeded access for VIPs and special guests. The head is aluminium cast. The arms are made of polished aluminium. During passages, the clothing of the users naturally brush off against the turnstile arms. If the arms are made up of matte-finish metal, as people access in and out and brush off against the turnstile, only a part of the metal finish starts to shine and that presents a rather worn-out cheap look. 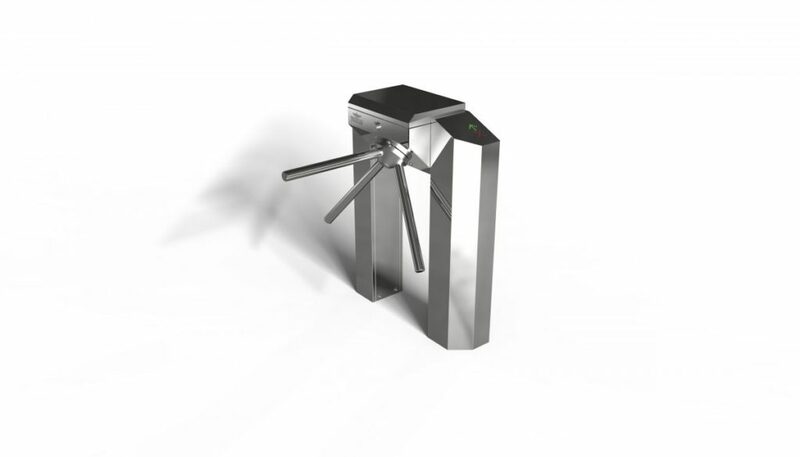 TANSA turnstile arms always look top-of-the-line due to their bright polished- aluminium construction.